This program can run on any version of windows. The more complex your scenes get the more resources they will use, and the 'slower' it will run. Importing chips will increase efficiency. Before file optimization was implemented, a stress test on an AMD Athlon 64 Dual Core 2.31 GHz, with 2 GB or Ram, ran 16 abstracted chips for a total of 51648 chips at 60fps and took 5.32 seconds to load. These chips where full of nonsense, you shouldn't have to have more than 200 chips to do some cool stuff. After file optimization, That same scene removed unnecessary chips for a total 34432 Chips and loaded in 2.31 Seconds. Runs better on intel due to the large ammount of tiny calculations. 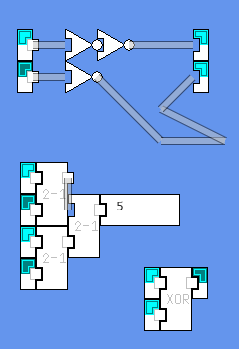 Place Link: Switch to Link tool(under misc), move tool to an output,Left Click and hold, drag to an Input, and release Left Click. Now the input you chose will get its info from the output. Delete Specific Chip: Change Tool to match 'unwanted' chip, place tool ontop of chip and Right Click. Delete Lots of Specific Chips: Change Tool to Delete(under misc), Hold Right Click down, and drag over 'unwanted' chips. Share Scenes: go to Help->Share Scene.Find the .dls file that is your scene, Send to recipient, have them place in your 'chips' directory(Help->Manage Scenes). Now they can load or import the scene on thier computer. 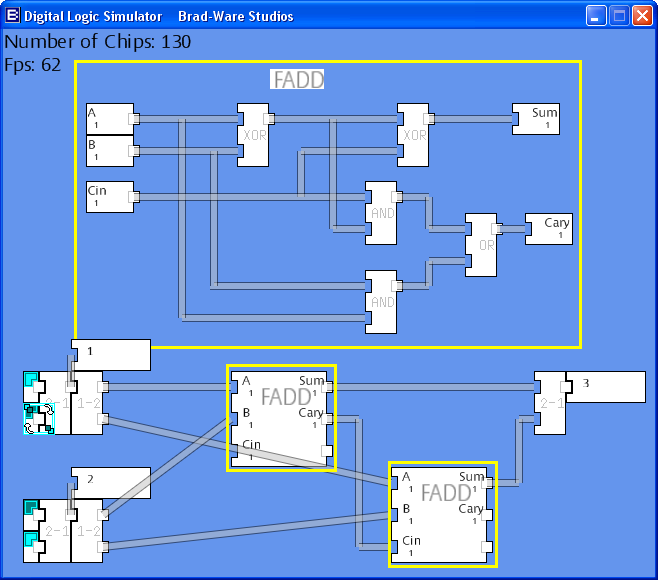 Abstract Chip: This is the most complicated proccess of this program. We will cover the small parts and then how to make it all come together. Add Input or Output: Inputs and Outputs need a bitsize and a tag. The bitsize tells the chips that recieve information from it, how many bits are being trasmited. Preview Abstract: This is where you change the caption, signal size, and order displayed. Click on the box you wish to edit, then input a value. Click the Checkmark to apply changes, or the X to cancel. Preparation for Import: When you have your outputs and inputs (maximum of 8 each), save your scene, with at least a 4 letter name. The first 4 letters of the name you give your scene will be displayed when you import. Now go to Abstract->Import. If you did everything correct, you should have an abstracted chip loaded to your tool, Left Click to add it to your Scene. !Do Not Save Your Scene With Its Own Abstract In It! This will cause the program to blow up next time you open or import that scene. Older gfx cards and computers without gfx cards, tend to cause the program to crash.We are investigating this issue. No copy paste, or move methods. But abstracts are better than copy paste. When using the link tool, you can have link a link to a link etc, forever, Exepct when the chip is abstracted, if you have linked a link to alink... more than 5 times the connection is broken. Recently an update was causing the installer to fail on most machines. We have disabled the broken links, and released a v0.4 that adresses this problem. Nesting is unlimited. You can now have chips inside of chips inside of chip etc. GUI upgraded. New Menu System. Abstract preview editor. Cheater chips. You can take 7000 chips to build a 256 Byte ram module, or you can use a scripted cheater chip to do all that way more efficently, so you can use 7000 chips on something else. Increased efficiency at loadtime and runtime. Improve GUI. More efficent scene files, faster save and load times.